Well, here we are again. I’m going to preface this review with the statement that I don’t envy publishers in today’s smartphone market. Thanks to what is certainly the most ridiculously high level of competition in any gaming market ever, it must be enormously difficult to balance getting your game into enough people’s hands with making enough money to keep the lights on. As with any difficult task, there are many figurative bodies on the floor resulting from missteps. There are free games that give away too much, leading to little income. There are free games that give too little, leading to being buried in obscurity. With so many free and low-priced games, publishers that choose to put a larger price on their games frequently face backlash or, worse, have their product entirely ignored. It’s a minefield, and I feel for you guys. For the players, though, the play’s the thing. All of this fiddling around with monetization seems to have an almost inevitable effect on the actual game design, which is why many gamers choose to stick to games that have a premium model. These games can usually be spotted by their relatively high price tag, but occasionally, you find a game that prices itself in a higher bracket but still seems to be designed around freemium-style monetization. I’m sorry for the lengthy preamble, but it’s unfortunately very pertinent to the game I’m here to talk about. 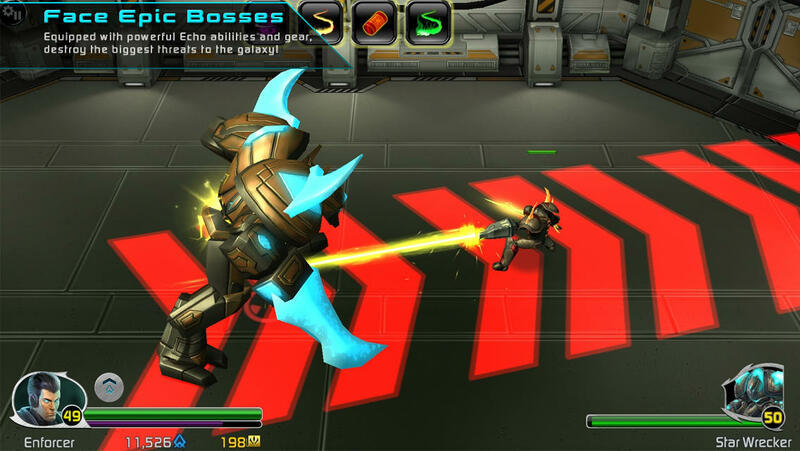 Echo Prime (Free), the latest from Robot Entertainment, the guys behind the free-to-play hit Hero Academy (Free), is a good action game. It’s also a premium-priced game with a design that seems informed by a desire to motivate IAPs. 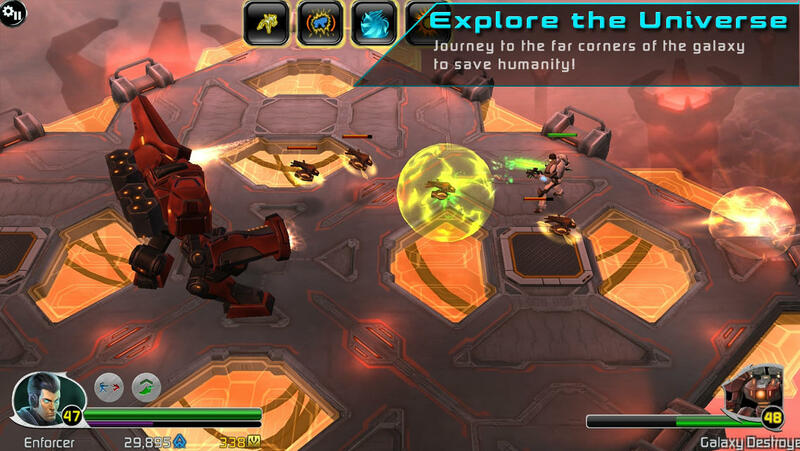 Echo Prime is a top-down sci-fi action game that looks like Diablo and even occasionally plays like it. You tap a location to move there, you tap an enemy to attack it, you tap an icon to use a special ability. You’ll earn experience points, level up, and use the money you find to buy new equipment. The fast pace of the game, its stage-based nature, and your character’s agility make this feel more like an action game than an RPG, though. When you’re battling some of the game’s large bosses, rolling out of the way of attacks, dashing in for a combo and getting out before the retaliation comes, and memorizing their patterns, it sometimes feels more like God of War than Diablo. Skill really counts here, and it’s easy to start thinking that in this game, it trumps all. It all comes crashing down sooner or later, though. Oh, admittedly, it’s pretty far down the line when it strikes, but it does come. Survival in Echo Prime requires skill to be sure, but more than that, it requires keeping your equipment up to date. Doing that requires you to earn a lot of credits, especially in the later part of the game. Earning a lot of credits requires a ridiculous amount of grinding. If you like, however, you can spend emblems to get new gear instead. Yes, there it is. A second, premium currency, which like many premium currencies can be earned through play, but in a very stingy manner. These emblems can be used in a variety of ways, including picking up new equipment and boosts, powering up your special abilities (called Echoes), and opening the various caches you find along the way. The game gives them out generously at first, so generously you might think they won’t be a problem, but about mid-way through the game, they dry up, which means you’re going to have to slowly grind out the huge amount of credits it takes to keep your equipment up to snuff. It’s too bad, because there’s a lot here to like. As you play, you’ll earn new Echoes, which are these weird sort of aliens that give you special abilities. Some of them are passive, while others are activated by hitting their icon at the top of the screen. They do things like boost your stats, attack enemies, or heal you. At first, you can only bring one of your own Echoes, but as you level up, you’ll be able to bring more. You’ll also be able to bring along one more Echo, either from your Game Center friends, or a random selection from other players. The Echo you bring will return to their owner with some credits in hand if you pass the mission. It reminds me of Puzzle & Dragons (Free), and I think it’s a cool social aspect that isn’t too intrusive. There’s a good variety of gear and it’s all visible on your character, which is always a nice touch. You’ll always be looking forward to your next piece of equipment, which is important for this type of game. There are quite a lot of missions, with plenty of optional missions peppered into the main story. A variety of gameplay objectives, like defending an object, exterminating all of a particular type of enemy in a very short amount of time, timed survival, and even having to wound and capture enemies break things up nicely from the usual “go from left to right shooting everything" missions. Sometimes you’ll even have a choice of different versions of a mission. This assists as much as it can with taking care of some of the monotony of running through a rainbow of narrow corridor after narrow corridor. Apart from the issues I have with its grind, the biggest problem I have with Echo Prime is how repetitive things tend to feel. The stages are not visually exciting at all. There are a few exceptions, but you’re generally just running down plain-looking hallways in this game, and always in the same direction, to boot. The enemy variety is also a bit weak, with the exception of the cool bosses. While enemies do get more powerful and more intelligent, there’s not much difference in how they look and sound. A little bigger, a few extra pieces of armor, and that’s pretty much how it goes. I’d have loved to have seen the sci-fi setting pushed for a few more interesting locales. Heck, even some variety in stage design aside from monster arenas and monster hallways would have been cool. I’m honestly kind of conflicted with Echo Prime. When it’s going, it’s fast and fun, and I love playing an action game like this that actually calls for a measure of skill and reflex. At the same time, it’s trying to get you into a longer game that it has trouble maintaining interest for thanks to some content that’s recycled just a little too much. When it stops, it really stops, and while I can’t say for sure that the grind is there to promote IAP, it sure feels like it is, and that kind of chafes me at this price point. There are lots of ways this could be a game that I’d want to recommend to others, but right now, the only thing I can truly say about my feelings on this game is that it’s not worth it.